Category: Witches. 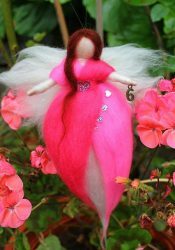 Tags: doll, handmade, needle felted, witch. This standing witch has been needle felted in Cornwall by mother and daughter, Pam and Tamsyn. Elodie has a bright emerald green wool dress, her dress has been decorated with Spring flowers, bluebells, yellow and white daffodils and green leaves. A little red ladybird crawls and a white bird rests in her hand. Elodie has long curly brown hair and holds a wooden handmade broomstick. Her green needle felted hat has been decorated with a blue forget-me-nots, green fern and a bumble bee! This witch is intended for use as a decoration, not as a toy. Loose fibres and embellishments may pose a choking hazard to young children. Keep away from pets. She is for indoor use only.